ABB sells Meyer Steel Structures to Dallas-based Trinity Industries for $600 million in an all-cash transaction, as part of the Swiss robotics, power and automation multinational giant’s non-core divestment program. After news of the sale was published, ABB shares rose 0.5% to 20.41 francs by midday Friday, and Trinity Industries shares were up 0.70% to $43.34 by the end of the day. In March, 2013, US conglomerate Nortek bought Thomas & Betts’ air conditioning, ventilation and heating business for $260 million in cash. Generac Holdings acquired Baldor’s generator-set business in October 2013 (price not disclosed). In April, 2013, Bel Fuse agreed to buy its power solutions business for $117 million. The ABB Group and Trinity Industries Inc. say the deal is expected to be completed in the third quarter of this year, subject to regulatory clearance. Trinity expects the transaction to be accretive to its 2014 full-year earnings. According to Trinity Industries, Meyer is forecast to record full-year 2014 revenues of about $325 million on a stand-alone basis. 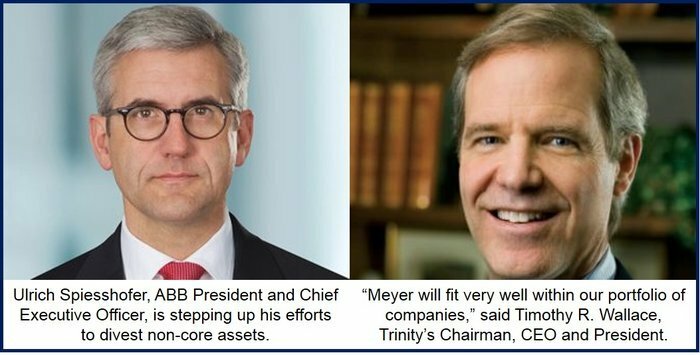 Upon completion of the transaction, Trinity says it will report Meyer’s revenue and earnings. Meyer Steel Structures is part of Thomas & Betts, which was acquired by ABB in 2012 for $3.9 billion in a cash transaction. The Swiss company says it is divesting the steel structures business of Thomas & Betts, which serves North American utilities companies with engineered steel mono pole structures for power transmission and distribution, because of a lack of synergies with its core portfolio. Trinity Industries, which also manufactures construction products, barges and railcars, says Meyer will be folded into its energy equipment group. Trinity Chairman, President and CEO Timothy Wallace said earlier this year that his company is interested in acquiring businesses that may enhance its portfolio. Trinity says it will fund the acquisition with available cash on hand. At the end of Q1, it reported $1.5 billion in total liquidity. Meyer, which was established more than 85 years ago and is based in Memphis, Tennessee, has more than 1,100 employees and four production plants in Alabama, Wisconsin, Texas and South Carolina. Trinity says it plans to keep Meyer’s head office in Memphis. TheStreet Ratings rates Trinity Industries as a “Buy” and gives it a ratings score of “A”. It says Trinity should outperform most of the stocks that it monitors and rates.